Grand opening today in Rimini (Italy) for Ecomondo, leading event in the Euro-Mediterranean area about sustainability, green and circular economy. Among key topics of 2017 edition there are Smart Cities, with demonstrations of innovative models of urbanisation, technological solutions, projects, and mobility schemes that improve quality of life and far-sighted territorial development. If you are visiting Ecomondo, don’t miss the Circular & Smart Cities conference, taking place on November 8th at 10am (Agorà Città Sostenibile Room). Pauline Cutter, Mayor of San Leandro, US, will introduce how the City is achieving ambitious climate goals by investing in smart technologies to reduce energy and water consumption, and enhance urban services management. Their solution is based on Paradox Engineering’s PE Smart Urban Network platform. 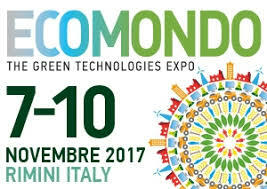 Ecomondo is running from November 7 to 10, 2017 at Rimini Expo Centre. Admission to the expo is on invitation or by purchasing tickets at entrance desks.